More than ever before, Laurie and I have been sensing the urgency of the hour in the epic commission Jesus has set before His people to take the gospel to every corner of the earth. A big part of fulfilling that mission is making sure the generations that follow us are prepared with the training, resources, and a heart for the Lord to press in with passion and purpose in reaching this world with God’s message of hope and grace. One organization that has been doing that for nearly 60 years is Youth With a Mission (YWAM), one of the largest youth-focused missions’ outreach organizations in the world. During a stop in Hawaii not long ago Laurie and I had the opportunity to visit YWAM’s Kona base, and to hear the vision God has given to YWAM’s founder, Loren Cunningham, to raise up thousands upon thousands of young people to take God’s love and mercy to a world in darkness. As we toured YWAM’s Kona campus and its beautiful University of the Nations, I was reminded of some amazing similarities my own father Paul Crouch shared with Loren Cunningham. Both were raised in godly homes by parents who committed their lives to ministry. My dad’s early years were spent in Egypt, where his parents served as missionaries. Likewise, Loren’s parents were pastors who poured out their lives spreading the gospel and planting churches across America’s Southwest. After high school, my father made his way to Central Bible College in Springfield, Missouri, where God began preparing and positioning him for the great calling that was before him: to cover the earth with the gospel message through the miracle of television. As my dad was finishing his education and stepping out into his first ministry, Loren Cunningham was arriving at the same school, where God would prepare him for a similar high calling. Of course, sixty years later we know the reason. Just like the vision God gave my dad back in the 1970s of life-transforming Christian television covering America — and ultimately the world — through a new little network called TBN, God was pouring a vision into the heart of Loren Cunningham for an organization committed to raising up young people to take the message of hope and healing through Jesus Christ to every corner of a lost and dying world. Not long before my dad passed away in 2013, he, Laurie, and I had the honor of hosting Loren Cunningham for a special TBN Praise program focused on global evangelism. It was a joy to watch these two seasoned men of God trading stories about their days in Bible college, and of the adventures each of them had as they spent their lives spreading the gospel across the earth — my dad through the “air force” of Christian television, and Loren as the “boots on the ground” equipping and releasing tens of thousands of young people into kingdom harvest. 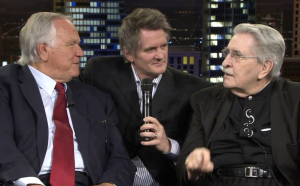 Matt Crouch (center) with two ministry giants: YWAM founder Loren Cunningham and TBN founder Paul Crouch. Fast-forward to the present. As Laurie and I visited with Loren and Darlene Cunningham at the YWAM base in Kona, it became clear that these two epic global gospel efforts — YWAM and TBN — are moving in the same strategic direction as each seeks to fulfill the scriptural command to take the message of Jesus to every nation and people. Even now the leadership of TBN and YWAM are exploring how we can combine the vision and momentum of these unique organizations to fulfill two important missions: to lead as many individuals as possible to faith in Christ, and to make sure that the ministry and outreach begun by Paul Crouch and Loren Cunningham in their respective fields of harvest continue for generations to come! Next Post Every Minute Matters!